Daniel & "Molly" Kauffman, 1933. Daniel Kauffman (20 June 1865-6 January 1944), was the son of Bishop David D. and Elizabeth (Winey) Kauffman. He was born in Juniata, Pennsylvania and died near Parnell, Iowa. The family moved to Elkhart, Indiana, in 1866, and to Morgan County, Missouri in 1869. He secured the degree of Principal of Pedagogics at the Missouri State University, taught school in Missouri 1883-1897, and served as county commissioner (superintendent) 1887-1890. For a time he conducted a private business college at Garden City, Missouri. He was married in 1887 to Ota J. Bowlin, who died in 1890. There were two children, James A., and an infant daughter who did not live. In 1902 he married Mary "Molly" C. Shank. They had six children. He lived in Missouri, most of the time at Versailles, until 1909, when he moved to Scottdale, Pennsylvania. One year, 1922-23, he lived at Goshen, Indiana. His closing months were spent in the Iowa home of his daughter, Alice. Under the preaching of J. S. Coffman he was converted in 1890, and joined the Mennonite Church (MC). He was ordained minister in 1892 and bishop in 1896. His natural gifts as speaker, teacher, writer, and leader soon made him the outstanding leader of the Mennonite Church and for over 40 years he made an impact on the church not approached by any other person. A born organizer, he led in the setting up of the organizational patterns which still are in effect. He was at one time a member of 22 committees and boards. He was a prime mover in the organization of Mennonite Church's General Conference, and its first moderator at the age of 33. He was the only person to have been moderator four times. Three times he preached the conference sermon, seven times was chairman of the Resolutions Committee, and at some time served as chairperson of most of the other important committees. He also served as moderator of the Missouri-Iowa and the Southwestern Pennsylvania conferences. Able to transcend all bounds of sectionalism and factionalism, he was a church statesman, serving often as mediator and conciliator. Kauffman urged the establishment of Hesston College, taught in the Bible School at Alexandria, VA, which proved to be the beginning of Eastern Mennonite College, and served one year (1922-23) as president of Goshen College. He taught winter Bible terms at all the Mennonite Church (MC) colleges, and was widely used as an instructor when the Bible Conference movement was at its height. Kauffman was a prolific writer at a time when the church was poor in writers. He was the author of the following books and booklets: Manual of Bible doctrine (1898), One hundred lessons in Bible study (1899), A talk with church members (1900), Life insurance (1903), A talk with our boys and girls (1906), Bible doctrines briefly stated (1908), One thousand questions and answers (1908), The conservative viewpoint (1918), The message and the message-bearer (1919), The Christian worker (1922), The Gospel mirror (1922), The Mennonite Church and current issues (1923), The way of salvation (1923), The two standards (1923), Mennonite history (1927), My vision of the future (1938), Fifty years in the Mennonite Church (1941), The devotional side of life (1942). 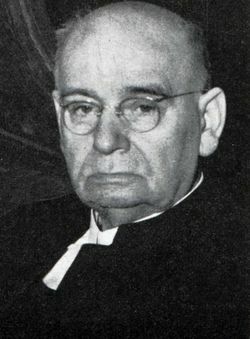 He served as editor of Bible doctrine (1914) and as editor and chief writer of Doctrines of the Bible (1928) and Mennonite cyclopedic dictionary (1937). He was co-author with J. S. Hartzler of Mennonite Church history (1905) and with J. L. Stauffer of Helps for ministers (1930). His greatest work was as editor of the Gospel witness (1905-8) and of the Gospel Herald (1908-43). Through wise editorial policies and capable editorial writing he used his position through 39 years to mold the life and thought of the church. Both as preacher and writer he came to be recognized as the spokesman of the church. His emphasis on doctrine made him the interpreter of the Mennonite Church to itself. He helped to launch Beams of light, was joint editor of the Sunday-School teachers' quarterly (1907-14), and editor for many years of tracts and the Family almanac. His biography, Life and times of Daniel Kauffman (Scottdale, 1954), was written by his daughter Alice. He was buried in the Alverton cemetery north of Scottdale. 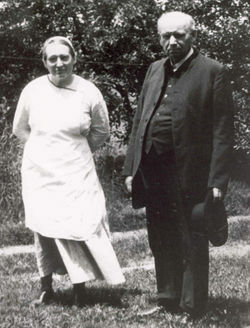 Daniel Kauffman was the leading spirit within the Mennonite Church (MC) from 1898 to ca. 1930 and continued as a strong leader up to the time of his death in 1944. He made his mark, theologically, with his Manual of Bible doctrines (1898), a new less historical approach to defining faith and life for the Mennonite Church. He made his mark as a churchwide leader, in the creation of Mennonite Church (MC) general conference (1898), again, a new approach to denominational structures for (Old) Mennonites, including the idea of a central authority which would in effect transcend the authority of the area conferences already established. (Four area conferences, in part because of this central authority from without, decided not to join formally the new denominational structures.) Thirdly, he made his mark within the church structures by becoming editor of Gospel witness in 1905, and its successor in 1908, the official denominational paper, Gospel herald, remaining in this position through 1943. In each of these attempts, Kauffman emerged successful, at least over the short term, in introducing and then maintaining a well-defined concept of doctrine. The term "doctrine" was hardly known within Mennonite circles before 1894, when Kauffman introduced the idea into the pages of the Herald of truth. His Bible doctrines volume, published four years later, set programmatically the concept in a manner still felt among some Mennonites in the 1980s. Kauffman's doctrinal approach emphasized a "true orthodox evangelical faith," to be expressed in modest, indeed, uniform dress for all church members, along with proper Christian demeanor and conduct in all areas of life. Kauffman's Bible doctrines of 1898 spelled all this out carefully and categorically. From 1898 to the 1920s Kauffman helped fill a void that was caused by a shift from German to English as the mother tongue of most Mennonite Church (MC) members. The English language rekindled the sense of witness and mission as given by Christ in his Great Commission (Matthew 28:18-20). Many youth longed to serve the church as "Christian workers," both at home and abroad. Kauffman's doctrinal approach was seen as useful within this context. Indeed, new and expanded versions of Bible doctrines came out in 1914, and again in 1928, with Kauffman serving as editor. This suggests a broad, accepting response on the part of the church at that time to Kauffman's approach to doctrine. With the coming of the Second World War, new forces were on the horizon that brought Kauffman's doctrinal era to an end for most of the Mennonite Church (MC). By 1944, a new configuration was in place which began to replace the doctrinal approach of Kauffman with an era defined by the Anabaptist Vision of Harold S. Bender and many others (Concern movement). The ahistorical era of Kauffman was transformed into a more traditional Mennonite approach to Christianity, including both faith and history as being of the essence of the Anabaptist Mennonite faith. Kauffman's impact in Canada was primarily in the Mennonite Church (MC) conferences in Ontario and Alberta. His books and editorial writings were widely read in those communities. Gingerich, Alice K. Life and Times of Daniel Kauffman. Scottdale, PA: Herald Press, 1954. Gross, Leonard. "The Doctrinal Era of the Mennonite Church." Mennonite Quarterly Review 60 (1986): 83-103. Hostetler, Beulah Stauffer. American Mennonites and Protestant Movements. Scottdale, PA: Herald Press, 1987. Erb, Paul and Leonard Gross. "Kauffman, Daniel (1865-1944)." Global Anabaptist Mennonite Encyclopedia Online. 1989. Web. 23 Apr 2019. http://gameo.org/index.php?title=Kauffman,_Daniel_(1865-1944)&oldid=143625. Erb, Paul and Leonard Gross. (1989). Kauffman, Daniel (1865-1944). Global Anabaptist Mennonite Encyclopedia Online. Retrieved 23 April 2019, from http://gameo.org/index.php?title=Kauffman,_Daniel_(1865-1944)&oldid=143625. Adapted by permission of Herald Press, Harrisonburg, Virginia, from Mennonite Encyclopedia, Vol. 3, pp. 156-157, vol. 5, p. 483. All rights reserved.